From census records to passenger lists to immigration and naturalization records, many of our favorite sources for family information captured a variety of spellings, handwritings, and abbreviations. As those historical collections have been digitized and transcribed, modern day technicians may have struggled to correctly interpret and preserve an entry from long ago. 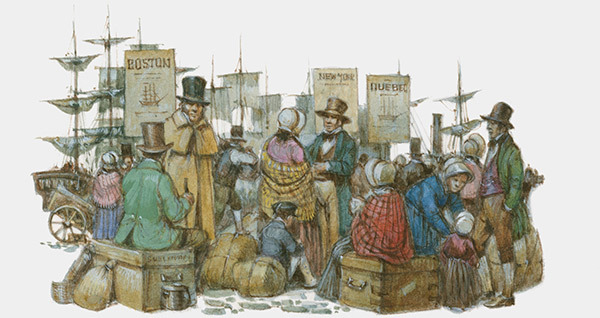 For family history enthusiasts in the United States, a challenge with name variations rings especially true as we are a nation of immigrants and their descendants. By understanding more about name variants, both first names, called given names, and last names, known as surnames, you’ll be better equipped to anticipate the challenges and employ the proper strategy to find the person you’re looking for. There are three general categories which contribute to name variants – alternate spellings of surnames, abbreviations of first names, and transcription errors. There is a widespread myth shared among family historians which is often used to explain variant spellings of last names, known as surnames: “The government changed the name at Ellis Island,” or so the story is told. Truth is, passenger lists were created at the port of departure, not upon arrival and there is not a single documented case of a family name being changed at Ellis Island. Many alternate spellings of surnames have evolved over many generations and differ from one ethnic group to another. Language barriers, literacy, and a desire to be viewed as American shortly after arrival likely account for many of the alternate spellings in use today. In some cases, the spelling variations are simple and subtle (e.g. – Phalen spelled as Phelan), in other cases the removal of a space or changing of one letter can also seem simple but have a big impact (e.g. – La Sorda, Lasorda, Lo Sardo, Losardo). Even some members within the same family adopted different spelling variations (e.g. – O’Rourke vs. Rourke). Search tip: Single character wild cards can be used to accommodate for these name variants while searching (e.g. – L?s?rd? would capture Lasorda and Losardo). If your family history research includes one or more surnames prone to multiple spelling variants, consider how you can use wild cards or advances search filters to locate those ancestors. Abbreviations are more commonly found in association with given names rather than surnames. While there were no set standards in place, most abbreviations are easily interpreted. Certain names, however, have more than one variation making it more difficult to search an online index without using some form of wildcard or other filter to capture all possible variants. For example: William was often abbreviated as Wm, Thomas as Thos or Tom, Patrick as Pat or Patk or Patr, Daniel as Dan or Danl or Danny, Margaret as Maggie, Elizabeth as Beth or Eliza. When searching for an ancestor, be mindful that an exact search for a given name may unintentionally hide an ancestor from view if the original record or transcription used an abbreviation. Search tip: Try using a wildcard (e.g. – Pa*) to find any name beginning with “Pa,” followed by any combination of letters. This will work for many, but not all abbreviations (e.g. – Lizzie as an abbreviation for Elizabeth). In addition to the alternate spellings and abbreviations already discussed, one unintended source of name variations ties to keystroke errors made during the transcription process. As technicians transcribe family history records, they seek to preserve content exactly as it appears in the historical original. Despite best efforts, errors do occur and names can be unintentionally altered. If this mistake occurs for the lead letter of a given name or surname of an ancestor, it can have an even more significant impact when hiding the record from view. If you encounter difficulties searching for an ancestor, particularly if your search yields zero results, be sure to investigate the advanced search features and wild card search capabilities. Search tip: Search using other information about an individual, but leaving both the given name and surname blank.